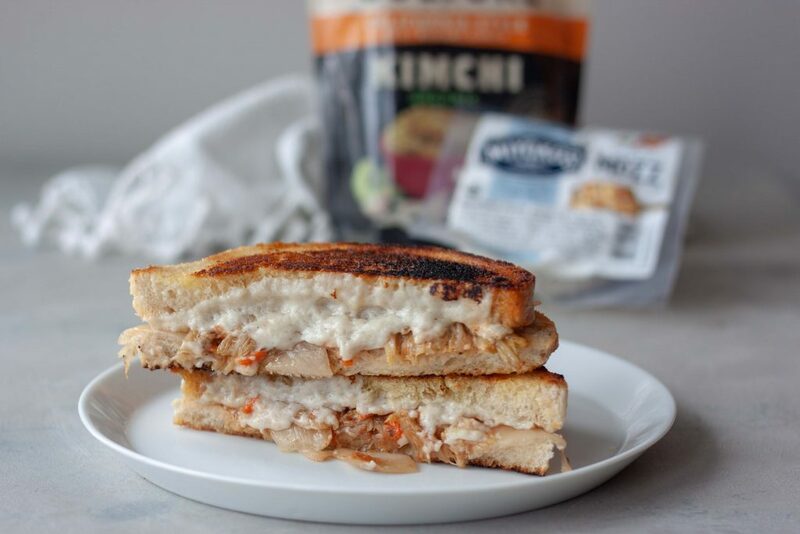 It’s National Grilled Cheese Day and I’m spicing things up with a Kickin’ Kimchi Grilled Cheese Sandwich! 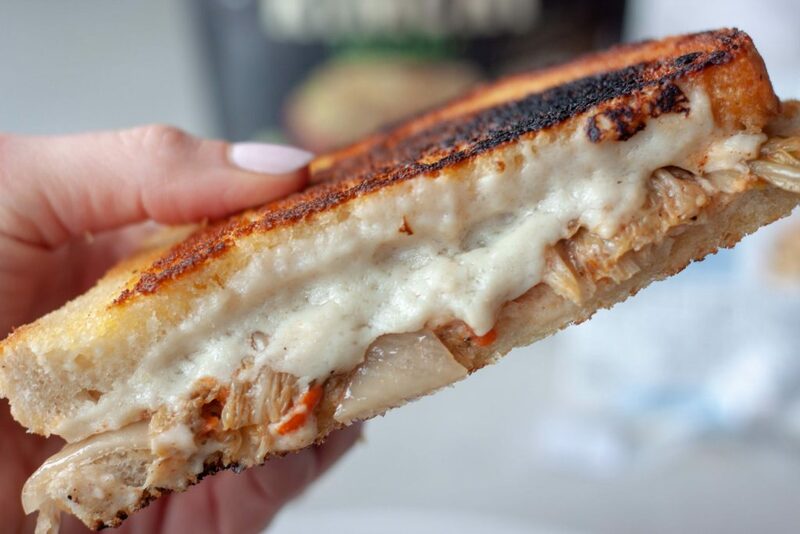 Don’t worry if you didn’t realize that today was National Grilled Cheese Day April is actually Grilled Cheese Month so you have all month long to enjoy this one. 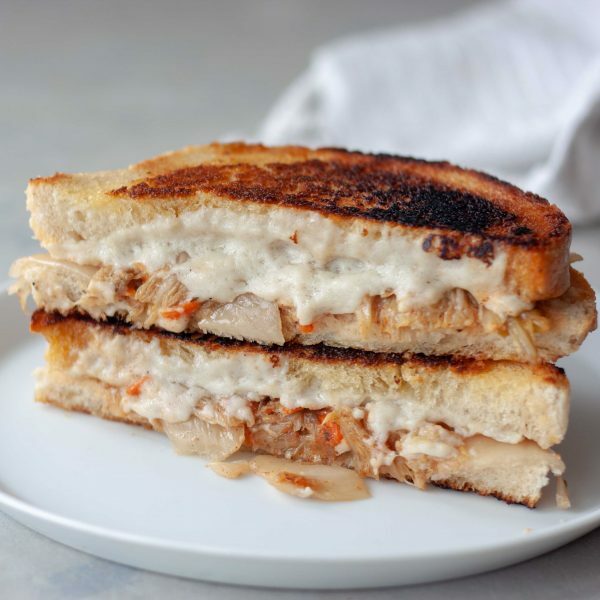 Not that there is a right or wrong time to enjoy grilled cheese, it’s a classic comfort food for a reason. Maybe not at the top of my comfort food list personally but I’d still consider it one. On top of sweet potatoes, soup, in sandwiches, in tacos, on burgers, the options are endless though and I share many other ways of enjoying it on Instagram Stories, or you can message me. If you’re a fan of kimchi let me know your favorite way to enjoy it so I can try it! Ok back to the real news of the day, this Kickin’ Kimchi Grilled Cheese Sandwich! Again it’s made with my personal favorite Miyoko’s Fresh VeganMozz, dairy-free/vegan, cheese that is my go-to for pizza and grilled cheese. Not to mention other things. Look how it melts!!! Yes I did cut the sandwich upside down so it’s covering the top of the bread since that should be the bottom but hey I was down to the last of my bread when I had to make it again because the first pictures were too dark and not my favorite because of this lovely weather. I have fresh sourdough going in the oven today so we can have grilled cheese tonight before the girls head to soccer and dance but wanted, nope make that NEEDED to, share this with you because it’s just that good. If you’re not a fan of spicy or kimchi you might like the Grilled Cheese Tomato Sandwich I posted on Monday. Are you celebrating National Grilled Cheese Day or month? What’s your grilled cheese go to? 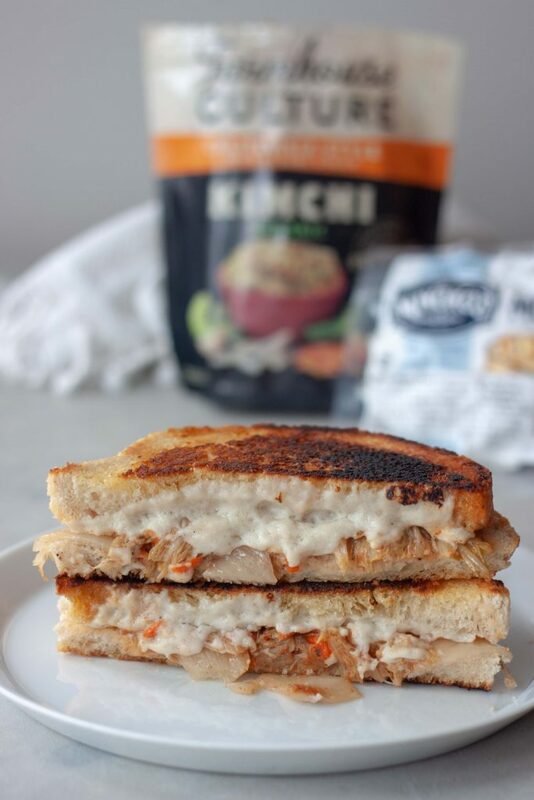 Spicing up a comfort food classic grilled cheese with this dairy free (vegan) Kickin' Kimchi Grilled Cheese Sandwich. 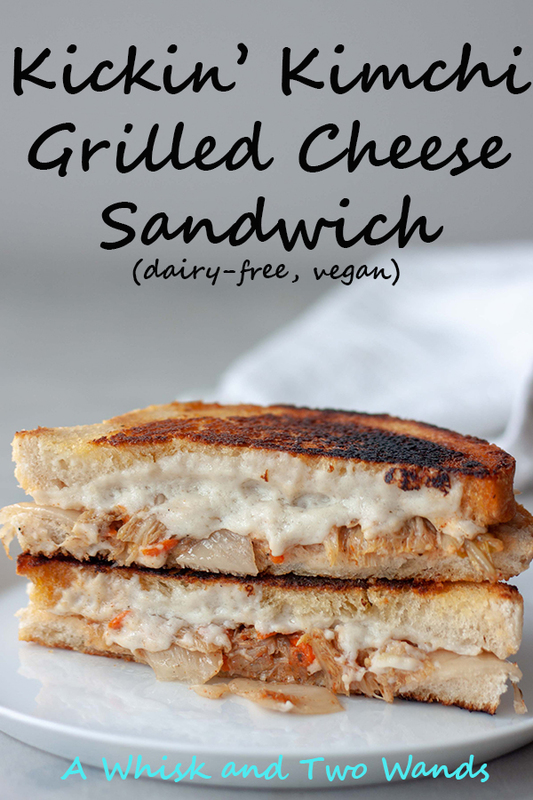 Gluten free friendly this sandwich is great for lunch or dinner. Spread the outsides of your slices of bread with butter spread. Place one slice of bread in the hot pan, butter side down, and add cheese. Using a slotted spoon to remove excess moisture add kimchi on top of the cheese and top with the remaining slice of bread, butter side up. If using an unsalted butter/substitute add a pinch of salt. This has to be the most mind-blowingly unique grilled cheese sandwich I’ve ever seen. The kimchi must give it an amazing pop of acid and heat. Well done! Oh my goodness, this is just oozing with deliciousness. My husband is eating sourdough now (had been gluten free for years), and that kimchi would be good for both of our tummies!